Public Transportation: Take the MBTA Red Line to Fields Corner (Ashmont Line). When exiting the train to the right, and take another quick right onto Dorchester Avenue at the end of the ramp. We are 1 1/2 blocks down on the right side. From Boston: Take 93 South to Columbia Road/JFK Umass (exit 15). At the end of the ramp, turn right onto Columbia Road, and immediately get in the left lane. At the first light (Dorchester Avenue), take a left. 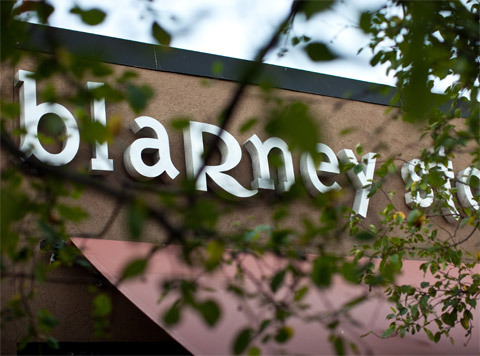 Go 2.1 miles south on Dorchester Avenue, and The Blarney Stone will be on your right side 1 block after the MBTA Overpass. If you go past Park Street (and the large park on the right) you've gone too far. From South Shore: Take 93 North to Ashmont (exit 11). Merge onto Granite Ave. Granite Ave becomes Adams St. Continue on Adams St. Take a left on Lincoln St, then take a left on Dorchester Avenue, Blarney Stone is immediately on your right.